Today I had a shoot with the amazingly talented Ella who I asked to come over to mine to shoot me and do some outdoorsy style shots for the blog. I think the words "I feel like a fashion blogger for the first time since I started blogging" came out of my mouth at many points. I've always taken my own photos for my blog, even from the early days using self timer on my step dad's crappy point and shoot. I thought I'd try something a little different in a aim to move the blog forward a little. But yeah, theres me. Outside, doing stuff. Posing. What'cha think? I think I got a little image heavy with this post, but there were so many photos I wanted to use! I dropped Motel a quick email last week after I saw this dress on the website and knew it had to be mine. I dont really like floral, its not something I'd tend to pick either. But the uber cute smock-y tea dress thing is one of my current favourite things, especially toughened up with a pair of chunky boots in the form of my Topshop Arabel Boots. Chunky, masculine, cut out perfection. I also got a pair of tickets today to Wireless Festival today (check it here) and I cant wait to see JT and Jay Z! I think I'll probably wear something like this there because it's cool, edgy and pretty easy. Especially with this heatwave that is going to hit London over the next few weeks! It's gonna be a hot'un! Really love this dress! Great photos too - you look really famous haha! Love these photos! You should do more like this! I love this dress, been lusting after it for forever, as well as the skirt in the same print! I switched to outdoor pictures a while back, has helped my blog heaps, obviously you don't need that as your pictures are always fab but these are a lovely change! i love everything about this look! the shoes, the dress, the sunglasses and the hat- just fabulous! how tall are you? that dress is amazing and i'm only 5ft so i don't want it to be too long! Loooove everything about this post! You really can't beat the beauty of natural lighting and being outside, makes everything look brighter. Love the dress. Really sweet outfit Lily! I've always loved how you take your own outfit photos, but this was a great alternative. So nice to do on a sunny day! Love, love, love this look Lily! The outside photos are really nice too - make the most of the sun whilst it's out I say! Love the dress, the exact same one that Perrie form Little Mix wore a few days ago! Love this outfit!! I think it was meant to be photographed outside!! I like the outdoorsy feel!! I hope you will be able to take more pictures outside in the future!! It gives a little change!! Love that dress! Motel have some gorgeous items at the moment! I'm loving the posey pictures! The dress and belt look great together. magazine - beaut as always! I literally gasped when I saw this. So edgy, but still quite feminine and OH those. Nail.s. !! LOVE THIS - oh so jealous of the boots, I'm keeping an eye out already for my AW13 pair! I want the whole outfit! Gorgeous! OUTDOOR PHOTOS. This is the most shocking thing I've seen on LLYMLRS since we discovered you had feet! Agreed with Aisling entirely haha! Love the new touch though! Also, I'm sure I have that dress in exactly the same pattern, cut and EVERYTHING, (but red) from Primark! Amazing pictures! I love your boots so very much.. I'm going to check if they have them in Topshop where I live as I think I'm obsessed! The sunglasses make your outfit so special!! This dress looks so gorgeous, I love it! Love these pictures so much, deffo do this kind of thing again, they turned out so well! 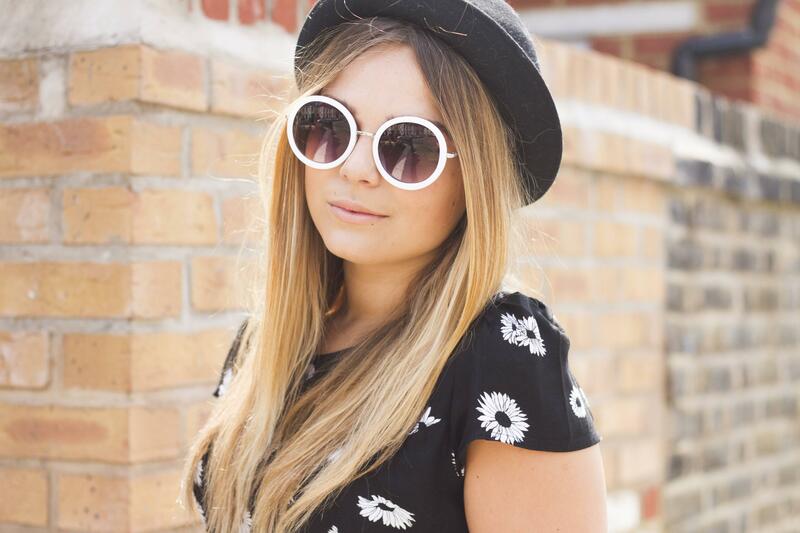 The dress is just too cute, looks amazing with your sunnies! gorgeous pictures :-) really want this dress now!! The pictures look great! I dont usually like florals either but I really like this dress! Literally in love with your dress and photos - such beautiful shots! I adore how the pictures turned out and that dress is amazing! Love this look! The dress is gorgeous. I love the dress! The whole look is lovely! 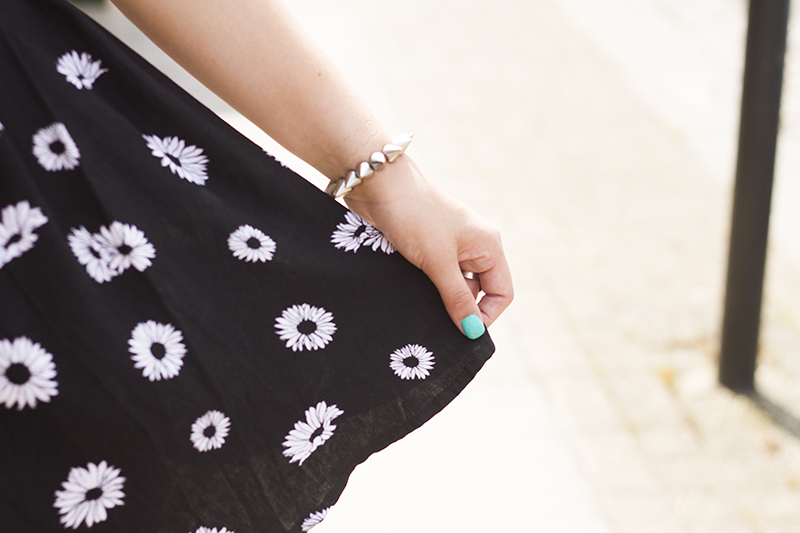 Ps:love that wonderful daisy dress! Gah, I have this dress in red but now I want it in black too. You look gorgeous as ever! Loving this girly look Lily. Pictures are amazing! Those sunglasses look amazing Lily! That's such a beautiful dress. Love your nailpolish! I love the dress, the pics and your sunglasses ♥ A LOT! i feel you! i've been doing the ol' bedroom door thing for so long I dont know anything different! so nice to have someone come take them for me! these photos are gorgeous! and the outfit in general is so nice! Stop me if I have the wrong end of the stick, but when you say you 'dropped Motel a quick email last week after I saw this dress on the website and knew it had to be mine' are you inferring that you asked for the dress for free in exchange for showcasing it on your blog? I can see that you received it as a PR sample so I assume that is the case. Stunning dress and I really love the photos as well. could you not have bought the dress yourself? you have marked it as a pr sample so i assume you just asked for it for free so you would show it on your blog. honestly it comes across as so tacky and the way you have worded it just rubbed me up the wrong way. I want this dress sooo much! I chance upon your blog when I was finding reviews for the dress! But it was unfortunate that I couldn't find any. But may I know if the dress is true to size? And, is it a little airy around the stomach area? You look gorgeous in the photos.